The new Deputy Chairperson of Rajya Sabha will be elected Thursday. The Deputy Chairman is a constitutional position created under Article 89 of the Constitution, which specifies that Rajya Sabha shall choose one of its MPs to be the Deputy Chairman as often as the position becomes vacant. The office becomes vacant either by resignation or removal from office or when the Rajya Sabha member’s term gets over. The last Deputy Chair of Rajya Sabha was Prof P J Kurien, whose tenure in Rajya Sabha ended on July 1. The process of electing the Deputy Chair is straightforward. Any Rajya Sabha MP can submit a motion proposing the name of a colleague for this constitutional position. They have until Wednesday afternoon to do so. The motion has to be seconded by another MP. Additionally, the member moving the motion has to submit a declaration signed by the MP whose name s/he is proposing stating that the MP is willing to serve as the Deputy Chairperson if elected. Each MP is allowed to move or second only one motion. On Wednesday, the valid motions will be taken up in the House a little after 11 am when the House convenes. If there are motions that propose the names of more than one MP, then the majority of the House will decide who gets elected as the Deputy Chairperson. But if the political parties arrive at a consensus candidate, then that MP will be unanimously elected as the Deputy Chair. 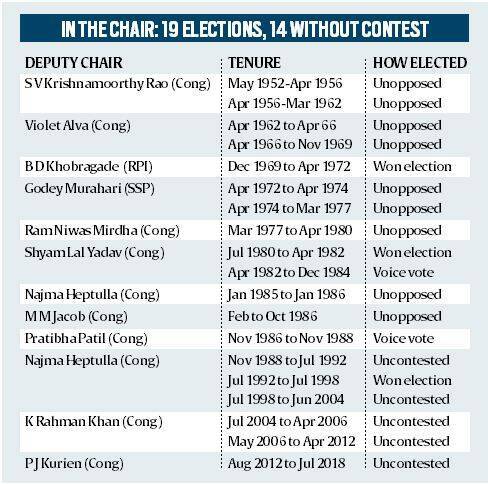 Since 1952, there have been 19 elections for the post. On 14 of these occasions, there was no contest in the election. 1969 was the first time that two MPs were in contention for the position of the Deputy Chair. By then, S V Krishnamoorthy Rao, the first Deputy Chair, had already served for a decade, followed by Violet Alva, the first woman Deputy Chair, who held the position for seven years. It was her resignation in 1969 that led to the contest between Dr Bhaurao Dewaji Khobragade and Godey Murahari. The motion for Dr Khobragade to be elected as the Deputy Chair was passed with 128 votes in favour and 60 against. It was the first time that a non-ruling party MP (Dr Khobragade represented Republican Party of India) became the Deputy Chair of Rajya Sabha. When Dr Khobragade’s term ended three years later in 1972, Murahari was elected unopposed twice and served until 1977. He then resigned and contested the Lok Sabha election and was elected the Deputy Speaker of the sixth Lok Sabha. 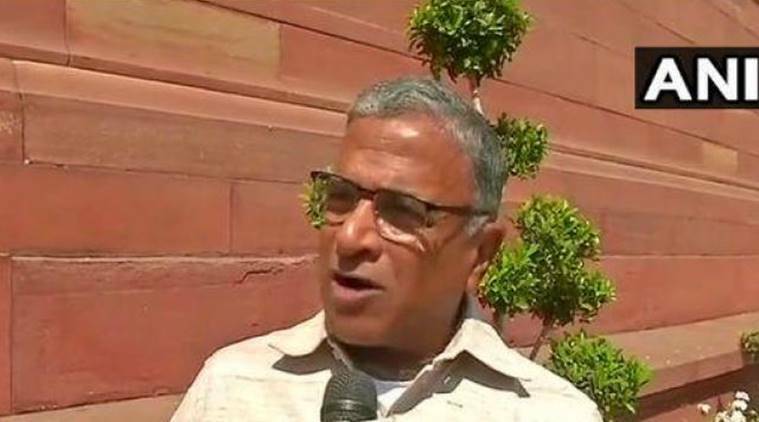 He and Krishnamoorthy are the only two individuals who have held the position of Deputy Chair of Rajya Sabha as well as Deputy Speaker of Lok Sabha. Ram Niwas Mirdha was the next Deputy Chair, elected in 1977 during the Prime Ministership of Morarji Desai. His election was unanimous. It was also the last time that an MP who was from the Opposition (Mirdha was a Congress MP) became the Deputy Chair of Rajya Sabha. The next contested election happened in 1980. It was between Shyam Lal Yadav, who was from the ruling Congress party and had been Parliamentary Affairs Minister in Uttar Pradesh, and Arvind Ganesh Kulkarni whose name was proposed by Bhupesh Gupta, L K Advani and Piloo Modi. A tally of 134 votes carried the motion in favour of Yadav, with 81 against him. Yadav held the position until the end of 1984. It was in 1985 that Dr Najma Heptulla became the second woman Deputy Chair of Rajya Sabha. During her election, Opposition MPs stated that the ruling party had not consulted them while deciding the candidate and walked out of the House in protest. Her first stint as the Deputy Chair was for a year. Her successor was M M Jacob, who was Deputy Chair for less than a year and was succeeded by Pratibha Devisingh Patil who became the third woman Deputy Chair in the Upper House. In 1988, Dr Heptulla was re-elected as the Deputy Chair. And it was her subsequent re-election in 1992 that saw the last contest for the Deputy Chair’s position. The motion in her favour received 128 votes with 95 votes against her. The candidate on the other side was Renuka Chowdhury (then TDP). Dr Heptulla continued as the Deputy Chair until 2004. She has been the longest serving Deputy Chair of Rajya Sabha. Since then, K Rahman Khan and Prof P J Kurien have both been elected unopposed. Although the Shiv Sena had given a motion for a candidate against Khan for his first election in 2004, the motion was not moved, following a consensus. The Deputy Chair is the one position that is elected solely by members of Rajya Sabha. It is a critical position not just because s/he steps in when there is a vacancy in the office of Chairperson/Vice President but also because s/he plays a critical role in ensuring the smooth running of the House.